Wheels featuring gray non-marking thermoplastic rubber tread mechanically bonded to polyolefin core. These lighweight thermoplastic wheels are excellent for clean environments. Benefits also include smooth and quiet rolling, and high resistance to oil, grease, water and most solvents. Thermoplastic tread is 70 +/- 5 Shore (A) Durometer. Maintain optimum operation of polyolefin core, thermoplastic rubber wheels with the appropriate wheel bearing for your application. 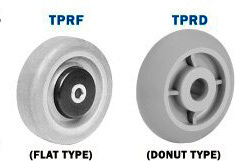 Please call 1-888-904-9531 for more information and to order thermoplastic rubber wheels. NCC-TPRDB3514 3-1/2 1-1/4 1-9/16* 3/8 170 3/8 "
NCC-TPRDB414-5/16 4 1-1/4 1-9/16* 5/16 190 5-16 "
NCC-TPRDB414 4 1-1/4 1-9/16* 3/8 190 3/8 "
NCC-TPRDB514-5/16 5 1-1/4 1-9/16* 5/16 200 5-16 "
NCC-TPRDB514 5 1-1/4 1-9/16* 3/8 200 3/8 "
NCC-TPRDR420 4 2 2-3/16 1-3/16 450 3/4 "
NCC-TPRDR515 5 1-1/2 1-5/8 1-3/16 450 3/4 "
NCC-TPRDR520 5 2 2-3/16 1-3/16 500 3/4 "
NCC-TPRDR615 6 1-1/2 1-5/8 1-3/16 500 3/4 "
NCC-TPRDR620 6 2 2-3/16 1-3/16 550 3/4 "
NCC-TPRDR625 6 2-1/2 2-3/4 1-15/16 600 1 and 1-1/4 "
NCC-TPRDR630 6 3 3-1/4 1-15/16 650 1 and 1-1/4 "
NCC-TPRDR820 8 2 2-3/16 1-3/16 600 3/4 "
NCC-TPRDR825 8 2-1/2 2-3/4 1-15/16 650 1 and 1-1/4 "
NCC-TPRDR830 8 3 3-1/4 1-15/16 700 1 and 1-1/4 "
NCC-TPRDR1025 10 2-1/2 2-3/4 1-15/16 800 1 and 1-1/4 :"
NCC-TPRDR1030 10 3 3-1/4 1-15/16 850 1 and 1-1/4 :"
NCC-TPRDR1225 12 2-1/2 2-3/4 1-15/16 900 1 and 1-1/4 "
NCC-TPRDR1230 12 3 3-1/4 1-15/16 950 1 and 1-1/4 "